For some students at Cheltenham Elementary School, math homework doesn’t add up without a home to go to. I had a student who was totally engaged and rocking it, said Christopher Razor, an instructor in the Denver Math Fellows program. The next day, the student came in, and their whole attitude had changed. It turned out the student was kicked out of the house and was living in a car. Unfortunately, for teachers trying to discover and address the unique learning situation of every student, the task can be daunting. The students we serve are usually two to three grade levels behind, Christopher said. One teacher in classroom of 20 kids and two, four or eight kids are a grade level behind. It is hard to create that lesson plan. For Christopher, the chance to build closer relationships with those students is what inspired him to become a Denver Math Fellow. The program, which provides small-group instruction for students who struggle with math, allows him to provide nearly one-on-one support to students who are facing what can seem like insurmountable challenges: a native Russian speaker trying to learn math while learning English; an African refugee navigating an entirely new education system; or a student experiencing problems at home. 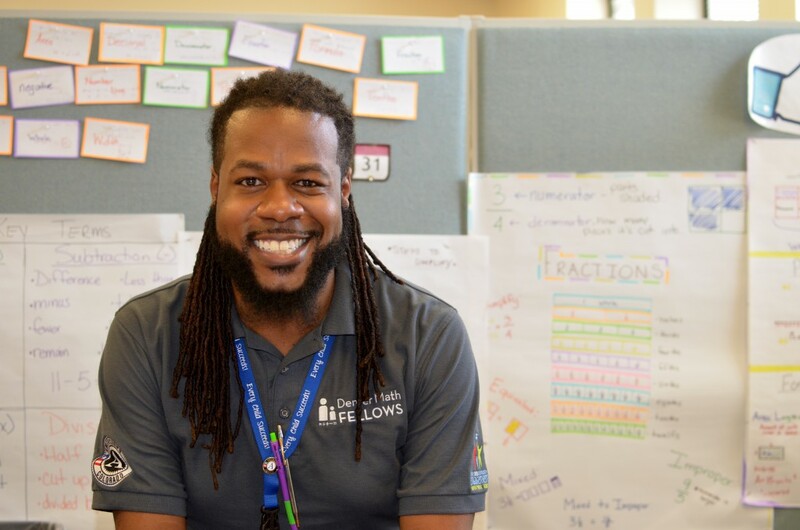 Thanks to the 2012 mill levy, Christopher is one of hundreds of Math Fellows at more than 50 schools working closely with students to understand their needs and achieve their full potential. The results? High-needs students are improving by multiple grade levels in math within a single year. We have created that foundation where students can trust us to tell us about issues at home that affect their learning style and motivation, said Christopher. I teach them that you are going to have days where it is going to be worse than the next one, but when you look at the grand scheme of things look how far you have come. Learn more about how Denver Math Fellows support students as learners and as kids.